Bermudians have been counting the costs associated with the passage of Hurricane Gonzalo, a category 2 storm that slammed into the British Overseas Territory on Friday night leaving thousands without electricity and making several roads impassable. A Royal Navy frigate with a crew of some 180 sailors was expected to arrive today to help with post-storm recovery efforts. Governor George Fergusson took to social media to inform that the police have reported no deaths or serious injuries and that damage has been extensive but not catastrophic. 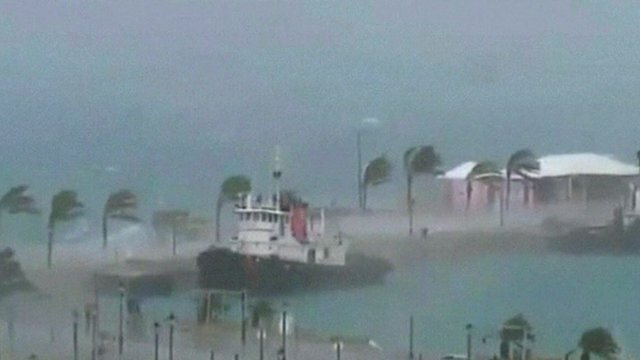 The island had closed its international airport and suspended all public transportation, including ferries. Police spokesman Dwayne Caines said that the storm had blown off part of the roof at the main hospital and there was water damage in the new intensive care unit. Many of the island’s 36,000 homes connected to Bermuda’s sole power provider were believed to be without electricity, a few days after power had been restored following the passage of Tropical Storm Fay. The Miami-based National Hurricane Center (NHC) said Gonzalo approached Bermuda as a Category 3 storm but weakened just before coming ashore with sustained winds of 110mph. NHC said Gonzalo, packing maximum sustain winds of 90 mph, had weakened as it moved away from Bermuda on a track that would take it past Newfoundland and then across the Atlantic. The storm was also blamed for the death of one person in the Dutch territory of St Maarten as it made its way through the eastern Caribbean earlier this week.